Send glad tidings to friends and family with three unique Kereru New Zealand Whisky Barrel Aged beers. Expertly aged in special oak barrels the likes of which will never be seen again. 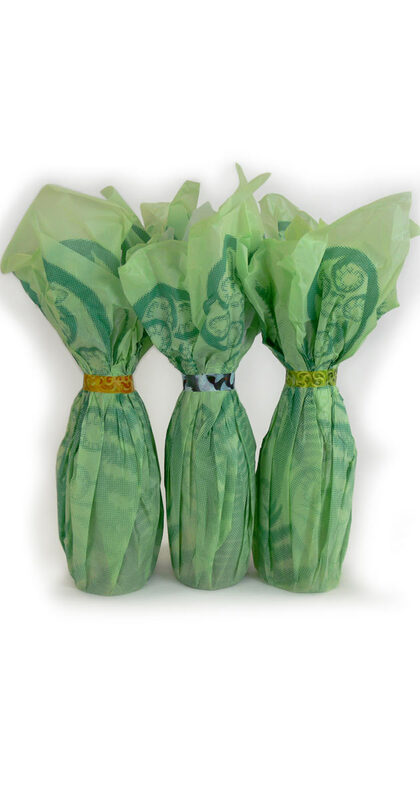 Each bottle is individually wrapped in custom printed tissue paper and is nestled in a sustainable nest of wood wool. All of the packaging is 100% recyclable and is part of our commitment to move away single use plastics. A handy key will guide you to know what is in each bottle. Our newest release: Seraphina NZ Whisky Barrel-aged Scotch Ale (Exclusive web release, extremely limited production) which has been held back to age and mellow in package to the point of perfection. Aged in NZ Whisky Collection Double Wood red wine casks these have a delicious note of sherry-casked whisky that melds with malt and oak. Night Spirit NZ Whisky Barrel-aged Imperial Stout (2018 Brewers Awards: Gold), This gold-medal winning luscious black ale has been aged more than 10 months in unique whisky casks that held very special NZ single malt whisky for more than 20 years. The casks have a great story to tell and amazing flavours to contribute to the beer. Originally these American oak casks held American bourbon from J. T. S. Brown and Sons (now Heaven Hill) and were coopered in the early 1960’s. The resulting beer is deep, dark, and intense in flavour with notes of oak, roasted barley, black malts, vanilla, and whisky. Paloma NZ Whisky Barrel-aged Barleywine Ale (2018 AIBA: Gold). This deep amber strong ale was aged more than 10 months in unique whisky casks that held very special NZ single malt whisky for more than 8 years. The casks have a great story to tell and amazing flavours to contribute to the beer. The casks (French and American Oak) originally held red wines from Mills Reef in NZ and then created the special Double-Wood/Oamaruvian releases from the NZ Whisky Co. The resulting beer is rich, nutty, and smooth with notes of dried fruits, raisins, Christmas cake, and tawny port. Count yourself fortunate if you are lucky enough to get your hands on some of these bottles. It is a unique experience which can’t be repeated and the beer will age gracefully for years. We expect the sweet spot to be around 3-5 years. Do not serve cold! Treat as you would a port or red wine and serve it in an elegant glass. Share with your friends! We've always said "consider yourself fortunate to get your hands on these bottles", and we mean it. The limit production runs keep our stock low, and once they're gone, they're gone. This is especially true for this year's newest release the Seraphina NZ Whisky Barrel-aged Scotch Ale. Available exclusively in the 2018 Premium Barrel Set, it's a rare specimen of brewing excellence.